I should really give my husband more credit. For instance, this watermelon rose slushee was all his idea. You see, he likes to browse Reddit, where he finds all sorts of crazy things, one of which was a watermelon keg. In the video (or maybe just a post) they cut open the top of the watermelon, used an immersion blender to blend the inside, then poured in some rose. Add a tap, and you have yourself a watermelon keg! Now, I'm pretty sure we didn't need a whole watermelon keg. But a watermelon and rose cocktail sounded delicious! HOW I MADE IT I started by cubing then blending the melon until smooth. Then I poured it through a sieve to get rid of all the pulp. I poured the juice into an ice cube tray to let freeze overnight. The next day, I blended the watermelon ice cubes with rose and a toich of lemon juice until I had something that resembled the Slurpee I used to get at 7-11. It is basically a grown up Slurpee. Just not as sickenly sweet and, you know, boozy. But its not too boozy. I only used 3/4 cup of wine for what was essentially 4 large cups. You could definitely add more if you want more of the rose flavor. But I loved how refreshing it tasted thanks to all that sweet waltermelon juice. It's the perfect Summer cocktail! Place watermelon in a blender and blend until smooth. Pour juice through a sieve to get rid of the pulp. Should result in 4 to 6 cups of juice, depending on the size of the watermelon. Pour juice into ice cube molds and freeze until hard. 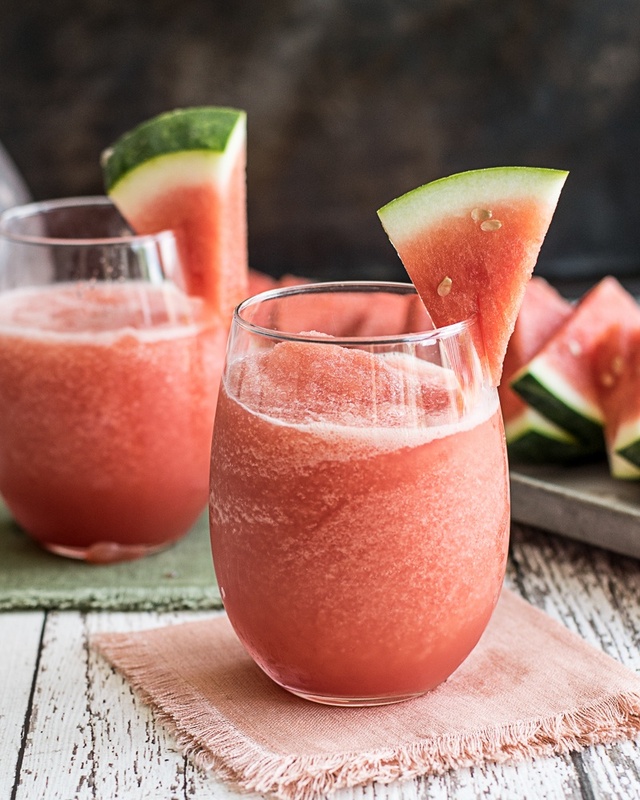 Add the watermelon ice cubes to a blender with wine and lemon juice. Blend until smooth, but still icey. Pour into glasses and serve immediately.